of Rudolf Elmer ASAP (see below WHY). Thank you! Taking Switzerland to the European Court of Human Rights in order to gain more protection for whistleblowers in 2019! and therefore Rudolf Elmer is punished with 14 months of imprisonment on probation and has to cover approx. CHF 320`000 court fees without receiving any compensation for the torture-like solitary confinement (23 hours locked in a cell) of 220 days, falsely request life-long professional ban by prosecutors and all other expenses Rudolf Elmer had, all due to blowing the whistle on Julius Baer, Cayman. Lastly, the probation period is three years. What Swiss authorities achieved in this 14-year legal battle most importantly that no investigation was performed against Julius Baer and its dubious staff members and that no investigation was performed on a big scale against Swiss tax evaders and international criminals in order to demonstrate that Switzerland is a safe haven for all sorts of money and non-financial-assets. Rudolf Elmer achieved that Julius Baer`s office in the Cayman Islands as well as in New York had to be closed down partially due to his initiative with WikiLeaks. On top it to take of the dubious mask of the Swiss judicial system which acts as the protector of the Golden Calf of Swiss Bank Secrecy. 6) Rudolf Elmer and his relatives had to learn the hard way that in Switzerland kin liability is still possible. The world is anything but a peaceful place. However, for many people it comes with a big surprise that Switzerland is one of those places where not only the profits of so many crimes end up or even the crimes are initiated and carried out in other countries but conscientious objectors and truth tellers are treated as enemy of the state. This is mostly possible because Switzerland does not have any whistleblower protection law in the private sector and will have none of it in the near future as it is already indicated by the Swiss Parliament. A Whistleblower protection law in the private sector would be a « deadly threat » to many industries in Switzerland particularly the Financial Industry of Zurich where Rudolf Elmer and his family have been fighting for justice by returning to Switzerland and going into the lion`s cage in 2010. Rudolf Elmer has run out of funds (e.g. using partly his pension funds assets to defend himself at the Federal Court of Switzerland) and he cannot take this crucial case for civil society without the support of a brilliant German lawyer to the European Court of Human Rights or even the United Nations. On the other hand, it is high time that Switzerland`s judges have to learn that there is an international civil society is out there which does not accept what Rudolf Elmer did not have a fair trail and he had to go through a court for 14-years. It is even worse because the Federal Court decided certain aspects of the verdict to the Higher Court of Zurich for reevaluation. Rudolf Elmer is now looking for financial support to allow this to happen that Switzerland faces international judges which are not bias as the Swiss appeared to be. People not only in Switzerland but also abroad already have stated this several times. May I kindly ask you to give Rudolf Elmer an indication on how much you are willing to donate in a crowdfunding action in order to collect approx. EUR 40`000 to hire a brilliant German speaking lawyer. Please send an email to email: rudolfelmer@gmx.ch with an indication of how much you would kindly support this initiative “Taking Switzerland in the Swiss Whistleblower case to the European Court of Human Rights ». 150secs.com (click) A whistleblower`s war against offshore banking (insight Rudolf Elmer). A single-handed fight against the Swiss banking system and its protector the judicial system of Switzerland according to the journalist. La loi du secret bancaire suisse ne pouvait être appliquée au cas Elmer … ! After 14 years of legal battle Elmer received an acquittal related to Swiss Bank Secrecy at the Federal Court of Switzerland. However, he is expected to pay CHF 320`000 court fees! The Federal Court cancelled the Court Ruling of the Higher Court except the acquittal of Swiss Bank Secrecy on Oct. 10th, 2018. The case is therefore pending! Le canton de Berne est-il plus intelligent que l’Union européenne ? recognising Global Tax Dumbing Schemes? Swiss Tax Reform 17!The EU Parliament resp. EU FINANCE MINISTERS appear NOT TO CONSIDER theRED CARD for Swiss Tax Reform 17 resp. blacklist Switzerland on the meetingMarch 13th, 2019. What a shame! Swiss Tax Reform 17 fair or unfair or even criminal? Marion Bethel: she showed how international tax dumping in favour of global corporations discriminates against women in two ways. On the one hand, the relocation of profits to tax havens and low-tax countries means that locally developed tax substrates are withdrawn from developing and emerging countries. On the other hand, aggressive corporate tax dumping in low-tax countries quickly leads to savings programmes and expenditure cuts. In both cases, funds for equal opportunities for women are withdrawn from public budgets. Urs Stauffer, » new tax privileges for companies particularly multi-national conglomerates (MNC) will be approved. The Swiss Federal Council and Parliament would have left it at cosmetic retouching. The old privileges, at least the majority of which are transparent, will be replaced by new ones! Rudolf Elmer: he particularly emphasized the numerous new possibilities of manipulation in the – non-public – tax balance sheet, which are opened up by the patent box, the over deduction for research and development and the self-financing deduction, release of tax free hidden reserves! Please take actions and forward this email to friends and supporters for fair taxation. Will GOOGLE, like WELTWOCHE, Chief Editor Roger Köppel and journalist Alex Bauer lose in court against Cantonal Council Candidate of Zurich Rudolf Elmer? Rudolf Elmer`s complaint (confirmation): It is to be determined that the defendants describe the plaintiff by the search machine « www.Google.ch » under the search term« Datendieb Elmer » as a data thief and spread it today still further, by the defendants the title to the pictures of Rudolf Elmer with « Bilder zu Datendieb elmer bzw. Images for Rudolf Elmer Datendieb » and to unlawfully violate and continue to violate his personal rights with the reference « Further pictures of Datendieb elmer or more Images for Rudolf Elmer Datendieb » on the search website. This also applies to the terms « Bilder zuErpresser Rudolf Elmer bzw. Images for Rudolf Elmer Erpresser ». The presumption of innocence applies to GOOGLE Switzerland and its CEO Patrick Gerhard Warnking. Wird GOOGLE gleich wie WELTWOCHE, Chefredaktor Roger Köppel und Journalist Alex Bauer gegen Zürcher Kantonsratskandidat Rudolf Elmer vor Gericht verlieren? Rudolf Elmers Anzeige (Bestätigung): Es ist festzustellen, dass die Beklagten den Kläger durch die Suchmaschine « www.google.ch) unter dem Suchbegriff« Datendieb Elmer » als Datendieb bezeichnen und heute noch weiterverbreiten, indem die Beklagten den Titel zu den Bildnern von Rudolf Elmer mit « Bilder zu Datendieb elmer bzw. Images for Rudolf Elmer Datendieb » überschreiben und ihn mit dem Hinweis « Weiterer Bilder zu Datendieb elmer bzw. more images for Rudolf Elmer Datendieb » auf der Suchwebseite widerrechtlich in seiner Persönlichkeitsrechten verletzen und weiterhin verletzen. Das gilt auch für die Bezeichnungen « Bilder zu Erpresser Rudolf Elmer bzw. Images for Rudolf Elmer Erpresser » und « Weitere Bilder zu Erpresser Rudolf Elmer bzw. more images for Rudolf Elmer Erpresser ». Die Unschuldsvermutung gilt für Google Schweiz und deren CEO Patrick Gerhard Warnking. Der GRECO Report 2017 (Group of States against Corruption, Council of Europe, Summary of the report says it all!) zu der Schweiz ist äusserst bedenklich für ein Land, das die SVP als Vorzeigestaat mit der Direkten Demokratie weltweit verkauft. The GRECO Report 2017 (Group of States against Corruption, Council of Europe, the summary or the report says it all!) on Switzerland is extremely worrying for a country and particularly the Swiss People Party marketing Switzerland as a flagship state with Direct Democracy and as a role model of a constitutional state. Swiss domiciled banks in trouble? Bloomberg: While the bad October started with the Swiss government`s data transfers, the Baer ruling raises difficult questions about how Swiss banks can in future control the flow of information out of tax havens around the globe. Lenders had been able to safeguard foreign clients`anonymity through the nation`s legendary bank secrecy laws. But last week the Supreme Court put clear geographic limits on Article 47 Swiss Bank Secrecy when it upheld the acquittal of whistleblower Rudolf Elmer….. The verdict was deliverd after Jacquemoud-Rossari and the other judges expressed their opinions at a public hearing, an unusual format (statistically it happens only in 0,3 % of all federal rulings) that shows it was intended for a broader audience, said Ursula Cassani, a University of Geneva law professor: « It is a precedent as precedents go in Switzerland, » Cassani said. says the Prof. Alexander of the University of Zurich. LAUSANNE, Switzerland (Link to Reuters) – Switzerland’s highest court ruled on Wednesday that prosecutors cannot extend Swiss banking secrecy rules to all corners of the globe to pursue whistleblowers and other leakers at foreign subsidiaries. Public Hearing: Can Swiss Bank Secrecy be applied extra-territorially or not that is the key question! An other acquittal (Higher Court of Zurich`s verdict was an acquittal on August 19th, 2016) would definitely mean that SWISS BANK SECRECY ends on the border of Switzerland and therefore offshore structures such as Trusts, Companies, Special Purpose vehicles who are legally set up and domiciled in e.g. Cayman, British Vergin Islands, Isle of Man etc. holding a Swiss Bank account with a Swiss bank domiciled in Switzerland will not be protected anymore outside Switzerland! AN ANOTHER NIGHTMARE FOR THE SWISS FINANCIAL CENTER?! The head judges will be Mr. Christian Denys who turned down the complaint against the present General Counsel of the Julius Baer Group, Christoph Hiestand LL.M. even though the General Counsel lied in the investigation, withheld Elmer`s Cayman employment contract etc (more here: Elmer`s complaint of October 24th, 2017 and the federal courts` verdict of December 12th, 2017). The complaint of Rudolf Elmer and the head judge`s reasoning will provide you with important and shocking insight how the entire legal case was handled by Swiss Authorities and gives you key information to the Public Hearing of the Federal Court October 10th, 2018. After 14 years of numerous legal battles it appears that a final decision is in sight in respect of the violation of Swiss Bank Secrecy or will the Federal Court of Switzerland return the entire case to the Higher Court of Zurich to revise its decision to charge Elmer with CHF 320`000 legal fees! other judges: Mrs. Laura Jacquemoud-Rossari, Mr. Yves Rüedi, other two unknown.These judges forced Rudolf Elmer to spend a big part of his pension fund money to pay his lawyer Ganden Tethong otherwise he would not have any defence in the Federal Court of Switzerland! What would an acquittal of Rudolf Elmer related to charges of Swiss banking secrecy violation by Swiss federal judges mean for the Swiss banking industry in general? All offshore vehicles (trusts, companies, partnerships etc.) holding a Swiss bank account would no longer be protected outside Switzerland, even though the information of the Swiss bank accounts is sent to Cayman, Jersey, Delaware etc. for accounting and administration purposes. The information would be accessible for foreign authorities from the point in time when the information on the Swiss Bank account crosses the Swiss border. The business model of using offshore jurisdictions like Cayman, Jersey UK, Isle of Man etc. to set up trusts, companies, and partnerships would not work anymore because the Swiss judicial system will no longer be able to protect the information – they will only be able to do that if the bank account is based in Switzerland. An acquittal of whistleblower Rudolf Elmer would be a real setback for Swiss banking secrecy. However, jurisdictions like Jersey UK, the Isle of Man, Monaco, Hong Kong etc. will profit because the bank accounts of their local offshore vehicles (trusts, companies etc.) will be held in their jurisdictions under the secrecy law of that jurisdiction. Because Switzerland does not have any trust law, partnership law etc. it means that many bank accounts will be moved to the place where the trusts, companies etc. are domiciled respectively set up! Zurich`s Higher Prosecution Office and Julius Baer arrogantly took this highly political case to the Federal Court of Switzerland in November 2016 hoping that the Swiss federal judges could bend and stretch the law again in order to prosecute Rudolf Elmer for violating Swiss banking secrecy. Now, this potential and crucial legal defeat might not only backfire on the Swiss finance industry but also on the entire Swiss offshore sector! Swiss Parliament turned down the reform of the archaic tax law where tax evasion is only an offence and not a crime in December 2016. Therefore, international assistance in tax matters will be very limited. In addition, there is no whistleblower protection law in place in the private sector in Switzerland. All in order to protect the dubious Swiss business of certain international service providers (banks, tax lawyers, Big Fours etc.)! Such a legal defeat for the Higher Prosecution Office of Zurich and Julius Baer would represent another Barbara Streisand Effect after WikiLeaks in 2008 and 2011. More importantly, acquittal by the federal judges would not only be a disaster for the financial industry of Switzerland but also for the industries such as commodity trading, precious metal refining, insurance, food, the pharmaceutical industry etc. due to the fact that the money flow from those industries go through Swiss bank accounts and all too often through global offshore jurisdictions as well. This goes to show how greed is the wrong motivator, not only in the banking industry but also this same greed underlying the actions of judges, the police, Julius Baer, and some of the Swiss media in giving a whistleblower a hard time and failing to act in the interest of the public, including the Swiss public. ZURICH/LONDON, Oct 31 (Reuters) – Swiss prosecutors are seeking a court ruling that would make it easier to convict whistleblowers for breaking the country’s bank secrecy law wherever they are in the world, legal documents show. Zurich’s upper court ruled last year that the bank secrecy law did not apply to him as an employee of the Caribbean subsidiary, rather than of the parent bank in Zurich. In their appeal, the prosecutors argue that if they cannot apply the law to people connected to Swiss banks outside the country, this deprives banking secrecy of its substance « with far-reaching consequences that cannot be accepted ». Under Swiss law, no public hearing will be held but the documents show the Federal Supreme Court is considering the written appeal. On June 9, 2017, it invited Elmer’s side to make a written response, which his lawyer has since submitted. The court is expected to issue a written judgment next year. A spokeswoman for Zurich’s senior prosecutors declined to comment beyond noting: « It’s up to the supreme court to decide on open questions. » Julius Baer also declined to comment. Switzerland is the world’s largest centre for overseas wealth management and in recent years has responded to international pressure, especially from the European Union and United States, for greater transparency. This includes participation in the Automatic Exchange of Information programme, an agreement among developed economies which aims to ensure that offshore accounts are known to tax authorities in the account holders’ country of residence. Some lawmakers in the EU are worried that the prosecutors’ move, if successful, may deter potential whistleblowers from supplying information on people accused of shifting their wealth to tax havens through accounts protected by secrecy laws. The law, they argued, does not require that « the contractual activity be exercised under Swiss law » for Swiss bank secrecy to apply. Even contractors, lawyers and consultants who perform work for a Swiss bank internationally should fall under the obligation, they added. Anti-corruption expert Mark Pieth disputed this in documents submitted by Elmer’s lawyer to the court. Should Switzerland extend the Banking Act beyond lenders regulated by the country’s FINMA financial watchdog or expand the definition of staff covered, parliament would have to change the law, Pieth said in a legal opinion seen by Reuters. An attempt to apply bank secrecy to the thousands of people working for Swiss bank subsidiaries abroad would be « way too broad », said Luc Thevenoz, who heads the University of Geneva’sCentre for Banking and Financial Law. Remise en cause de l’échange automatique d’information de la Suisse avec des pays dits « corrompus » comme l’Inde … ? le principal parti suisse tient cette position … Mais pour avoir de la corruption, ne faut-il pas un corrupteur ? La Suisse et ses banques autant de vierges effarouchées … ? This document (in English) explains the scope of administrative work performed by the judicial system of Zurich, which now moves in an astronomical level. As of today, more than 100 six-centimeter thick binders have been compiled on the basis of a trial which has lasted, as of today, for a period for more than 12 years. There have been 1,741 pages of indictments, judgments, pleadings and expert reports published (this does not include the number of pages of all interrogation protocols, legal orders, supplements, evidence, etc. ), 48 prosecutorial interrogations of Rudolf Elmer by public prosecutors, and 5 judicial coercive actions. The costs of which are now largely borne by the citizen and taxpayers. Bank Julius Baer & Co. AG, Zurich and the General Counsel of the Julius Baer Group, attorney Christoph Hiestand, are the sources of his misrepresentation on his interrogation on August 18th, 2008 where Christoph Hiestand lied. Despite Mr. Hiestand’s manipulative behavior and deceptions in the court proceedings (attachments), he will not be held responsible by the judicial system of the state of Zurich. The pressure made by the Prosecutor and Judges on a child on top of it not protecting the child from the stalkers and private detectives by the Police and by the judicial system of Zurich escalated to a point which is simply chocking and disgusting but demonstrates in my view the revenge taken by these powerful bodies of Switzerland on a whistleblower and his family! Whistleblower Protection in Switzerland is a « NO-GO » due to the fact that the financial industry and particularly the private sector would loose so much dubious business or to be blunt PROFIT !!! That is simply the truth and the driving force behind all retaliation against truth tellers within Switzerland! Letter of JB to Prosecution Office confirming Rudolf Elmer is not employed with Bank Julius Bär & Co. AG, Zuerich, therefore Swiss Bank Secrecy cannot be applied! Documents kept secret (newspaper report: Prosecution witheld key documents! There is the related article of WELTWOCHE « Ein schlechter Informant » (« a poor informant ») and the publishing of the verdict of the Higher Court of Zurich related to the statement in the article « Rudolf Elmer gave client data of Julius Baer to several groups of NeoNazis ». The latter statement represents a severe unlawful violation of privacy of Whistleblower Rudolf Elmer! La Weltwoche s’est rendue coupable d’atteinte à sa personnalité et à son honneur en affirmant le contraire dans un article de janvier 2011. La justice zurichoise a donné raison sur ce point au lanceur d’alertes autoproclamé. En mai 2016, le Tribunal de district avait déjà reconnu coupable le magazine de droite dirigé par le conseiller national UDC Roger Köppel d’atteinte à la personnalité dans la même affaire. L’hebdomadaire avait été sanctionné pour avoir prétendu que Rudolf Elmer avait menacé de mort et insulté d’anciens collègues et supérieurs à plusieurs reprises. Rudolf Elmer avait fait appel, estimant que l’hebdomadaire devait aussi être condamné pour avoir faussement laissé entendre qu’il avait vendu des données bancaires au parti d’extrême-droite PNS/PNOS et à des groupes néonazis. En seconde instance, la Cour suprême a donné suite à cet appel dans un jugement daté du mois dernier, rendu public vendredi. Dans l’article du 26 janvier 2011, la Weltwoche a non seulement porté atteinte à l’intégrité professionnelle de Rudolf Elmer en tant qu’ancien collaborateur de la Banque Julius Bär, écrivent les juges. Elle suggère aussi une proximité du plaignant avec la scène néonazie et des sympathies pour l’idéologie d’extrême-droite. Sur cette base, le lecteur moyen est susceptible d’attribuer à Rudolf Elmer une attitude antisémite, l’article soulignant au passage que la Banque Julius Bär est considérée comme juive. Une description des faits aussi incorrecte porte atteinte à l’honneur et à la personnalité du plaignant, conclut la Cour. Ce verdict de seconde instance contraint désormais la Weltwoche à publier une version raccourcie du jugement dans ses pages et sur son site en ligne. En attendant, le jugement peut encore faire l’objet d’un recours au Tribunal fédéral. Interrogé par l’ats, l’auteur de l’article Alexander Baur tient à relativiser l’importance de ce nouveau jugement. Le tribunal de première instance avait donné raison à la Weltwoche sur 14 des 16 points litigieux, rappelle le rédacteur. Ce chiffre descend à 13 après la décision de seconde instance. Dans le jugement de première instance, la Weltwoche, son patron Roger Köppel et Alexander Baur avaient aussi été condamnés pour un article publié en 2012. Le magazine y avait qualifié Rudolf Elmer de «voleur de données» et de «maître-chanteur» dans un article intitulé «Traître honorable». Les conclusions de la justice sur cet aspect restent intactes. Quant à la procédure pénale engagée contre l’ancien banquier, elle n’est pas encore arrivée à son terme. En août 2016, la Cour suprême zurichoise a reconnu Rudolf Elmer coupable de menaces et de faux dans les titres pour avoir voulu se venger de son ex-employeur à travers des courriels menaçants et des lettres falsifiées. En deuxième instance, elle l’a sanctionné de 14 mois de prison avec sursis. WELTWOCHE stated that Rudolf Elmer provided data to Neo-Nazis and implied that he is an anti-semitist. However, this is definitely not true because I have made many wonderful jewish friends and to be crystal clear also many of them (Ex-US-Senator Carl Levin, both my US lawyers etc.) are strong and helpful supporters in my fight against the abusive practice not only of Julius Baer but also of certain media like WELTWOCHE and part of the Swiss legal system. As a matter of fact I was trained by great jewish people like Hans J. Baer (known for his bold statements « Swiss Bank Secrecy makes us fat and impotent » or « the bankers lack the grace when stealing », Terry Murphy etc. and they taught me not only banking but also human relationships, living with the truth and that the truth will always win, how to defend tooth and nail and fight for your rights even if the opponents try to destroy you and your family as it has been happening in the Causa Elmer for more than 15 years. Extract of the ruling of the Higher Court of Zurich dated May 9th, 2017 . The Higher Court of Zurich turned the case down to the Lower Court to review its verdict entirely. The Swiss Press is now picking up and even comments comprehensively on the abusive practice of the two journalists ALEX BAUR und the owner of the newspaper and Swiss Parliamentarian ROGER KOEPPEL. It is an eye-opener to read how WELTWOCHE tries to play down the fact that they have lost again (already in 2012 AZ Media) against a whistleblower. Récupérer les données des fuites fiscales … la Belgique pourrait aussi s’y mettre … où en est-on en ce mois de mars 2017 ? question parlementaire du député Georges Gilkinet (Ecolo). C’est La Libre Belgique qui indique l’information. Pourquoi? Par cette mesure, les Finances ambitionnent de récupérer les centaines de millions d’euros ayant éludé l’impôt, notamment dans les fuites connues sous les noms de Swissleaks, Luxleaks et Panama Papers. Un groupe de travail a été mis sur pied dans ce but. Il va analyser les exemples de l’Allemagne et du Danemark, qui ont déjà cette possibilité. Son rapport est attendu au printemps prochain. A 17 heures 45 ce lundi 19 décembre 2016, le ténor du barreau parisien William Bourdon concluait sa plaidoirie en flagornant le juge Michel Reiffers, «en acquittant Antoine Deltour, vous allez devenir l’honneur de la justice luxembourgeoise, l’honneur de la justice européenne» et recueillait du même coup des tombereaux d’applaudissements. La cause de son mandant n’est cependant pas entendue et elle ne se règle pas non plus à l’applaudimètre. Le premier avocat général John Petry a requis lundi 6 mois de prison avec sursis et une amende de 1.500 euros contre Antoine Deltour, 31 ans, jugé par la justice luxembourgeoise pour avoir soustrait à son ancien employeur PricewaterhouseCoopers le 13 octobre 2010 plus de 40.000 pages de documents confidentiels. L’ancien auditeur en avait ensuite confié une partie, une vingtaine de milliers de pages attestant de l’optimisation fiscale de grandes entreprises clientes de la société de conseil, au journaliste français Edouard Perrin, 45 ans. Il les avait ensuite utilisés en mai 2012 dans une émission. On les a retrouvés sur le site internet du consortium international de journalistes ICIJ le 5 novembre 2014. Le journaliste de 45 ans figure aujourd’hui aussi sur le banc des accusés. Dans un premier jugement rendu le 29 juin, Antoine Deltour avait écopé de 12 mois de prison avec sursis et de la même amende. Le juge Marc Thill lui avait toutefois reconnu le statut de lanceur d’alerte pour avoir servi l’intérêt général en dénonçant des pratiques fiscales «immorales». Fort de ce jugement et face à un réquisitoire de l’avocat général contestant la plénitude de la protection du lanceur d’alerte dont pourrait bénéficier l’ancien auditeur au regard de la jurisprudence de la Cour européenne des droits de l’homme, William Bourdon a fait valoir «l’absurdité» des critères fixés par John Petry et son contradicteur de la partie civile, PwC, Hervé Hansen. «Devoir prouver l’instantanéité de la conviction qu’Antoine Deltour est un lanceur d’alerte au moment même de la soustraction des documents, comme on érige l’instantanéité du vol en droit, est absurde» a répondu Me Bourdon à l’avocat général. «Pas un document n’a été versé au dossier pour étayer le préjudice subi par PwC. Alors quand on ne peut pas faire, on demande un euro, mais un euro c’est déjà trop», a rétorqué le représentant de M. Deltour face à ceux de son ancien employeur, PwC, qui avaient quelques minutes plus tôt rappelé que leur mandant avait subi un «préjudice grave» en devenant victime de cette fuite massive de documents confidentiels. Comme en première instance, Me Hansen a dit ne pas croire qu’Antoine Deltour et Raphaël Halet (41 ans), un autre ancien employé de la firme ayant communiqué des documents confidentiels à M. Perrin, ne soient des lanceurs d’alerte. «Il n’y a pas de bonne foi de leur part» a prétendu l’avocat de PwC avant de souligner que se prétendre lanceur d’alerte n’était qu’une stratégie de défense «opportuniste» pour éventuellement se cacher derrière l’article 10 de la Convention européenne des droits de l’homme consacrant la liberté d’expression. De cette joute verbale jouée avec emphase de la part de Me Bourdon n’est encore ressortie aucune décision des juges. La Cour d’appel doit entendre les représentants de MM. Halet et Perrin les 4 et 9 janvier prochains. L’avocat général a requis une simple amende contre l’ancien secrétaire du département fiscalité de PwC (9 mois avec sursis et une amende en première instance) et l’acquittement pour le journaliste (comme dans le jugement du 29 juin). Les parties défenderesses réclament l’acquittement «sur toute la ligne». Lundi 12 décembre 2016 s’est tenue la première journée du procès en appel d’Antoine Deltour, Raphaël Halet et Edouard Perrin, les trois protagonistes du scandale « LuxLeaks ». Des militant·e·s venus de plus de 20 pays différents étaient présent·e·s pour les soutenir et réaffirmer l’importance de lutter contre l’évasion fiscale. Retour sur une mobilisation internationale sans précédent, coordonnée par les organisations de la Plateforme contre les Paradis Fiscaux et Judiciaires (notamment Attac France, ActionAid France – Peuples Solidaires et le CCFD-Terre Solidaire), Tax Justice Europe et les comités de soutien luxembourgeois et français. LuxLeaks Day of Action – Support the defendants! Join more than 100 campaigners from 20 countries across Europe, and show your support for the whistleblowers Antoine Deltour and Raphaël Halet, as well as journalist, Edouard Perrin, who helped expose the LuxLeaks scandal. Thanks to the LuxLeaks scandal, we know that the Luxembourg government signed hundreds of secret tax rulings – also known as ‘sweetheart-deals’, which were brokered by PwC and allowed corporations to avoid taxes in the billion Euro scale. In total, the revelations, brought to light the secret tax arrangements of 340 corporations, which enabled them to lower their tax payments, in some cases to less than 1%. The events are organized by a coalition of civil society organizations, including CCFD-Terre Solidaire, Attac, Oxfam, ActionAid, Tax Justice Europe and the support committees of the defendants. This publication has been produced with the assistance of the European Union. The contents of this publication are the sole responsibility of the organizers and can in no way be taken to reflect the views of the donor. More than one hundred campaigners from 20 countries across Europe will be in Luxembourg to call for the protection of whistleblowers when the men who exposed the LuxLeaks scandal appear in court again next week. On 12 December, former PWC employees Antoine Deltour and Raphaël Halet, and journalist Edouard Perrin, will return to court after the verdicts of their initial trial earlier this year were appealed. Activists from across Europe will demonstrate outside the court to show their support for the defendants. They will call on governments across the EU to protect whistleblowers and make multinational companies publish where they do business and what they pay in tax. “These three men have the support of people from numerous countries across Europe who will all gather to show their support for their actions. The original sentences of Mr Deltour and Mr Halet were a total disgrace, and we want this injustice to stop. You shouldn’t have to go to court for exposing the fact that that multinational corporations are dodging taxes. In 2014, all three men helped expose the secret sweetheart deals signed by the Luxembourg government that allowed numerous multinational corporations to reduce their tax bills dramatically, in some cases to less than 1%. Media contact: Julia Ravenscroft, Communications Manager at Eurodad, on +32 486 356 814 or jravenscroft@eurodad.org. About the trial: On 23 June 2016, a court in Luxembourg sentenced both Antoine Deltour to a 12 month suspended prison sentence and a €1500 fine, and Raphaël Halet to a nine month suspended prison sentence and a €1000 fine. Both have appealed their convictions. The journalist Edouard Perrin was acquitted, but the decision was appealed by the public prosecutor in Luxembourg. At the start of the trial, prosecutors asked for 18-month prison sentences for both whistleblowers and a fine for Perrin. The Luxleaks revelations: Antoine Deltour and Raphaël Halet were former employees of ‘Big Four’ accountancy firm PwC who exposed hundreds of secret Luxembourg tax rulings – also known as ‘sweetheart-deals’, which were brokered by PwC and allowed corporations to avoid taxes in the billion Euro scale. In total, the revelations, which became known as LuxLeaks, brought to light the secret tax arrangements of 340 corporations, which enabled them to lower their tax payments, in some cases to less than 1%. Today is International Anti-Corruption Day, a day to reflect on how corruption continues to undermine our hopes for a better society, but also to reflect on the ways that we can make a difference in the global fight against corruption. Ultimately, change will come from thousands of small acts of bravery and integrity, and for this reason we highlight today the inspiring story of a young Slovak official, Zuzana Hlávková, who last month blew the whistle on some very suspicious use of public money as part of the Slovak Presidency of the EU. You can read her story in an exclusive interview on our new website. We need more people like Zuzana to speak up. For that reason, we are calling on the European Commission to bring forward legislation that would provide a minimum level of protection for whistleblowers all around Europe. This will also ensure that people like Antoine Deltour and journalists like Rafaël Halet are not prosecuted and persecuted for actions that are in all of our interests. Deltour and Halet’s case is back in court in Luxembourg on Monday. Empowering citizens in this way is at the heart of Transparency International EU’s new 2020 strategy, which you can read more about here. We look forward to continuing the fight with you in 2017 and beyond! Les condamnés iront en appel Les trois accusés français poursuivis au Luxembourg pour avoir mis au jour les pratiques fiscales décriées du Grand-Duché, le scandale LuxLeaks, sont fixés sur leur sort. Les deux lanceurs d’alerte écopent d’une peine de prison de 12 et 9 mois avec sursis. Quant au journaliste, il a été acquitté. La justice luxembourgeoise a condamné à 12 mois de prison avec sursis l’ancien employé de la firme d’audit PricewaterhouseCoopers Antoine Deltour, à l’origine du scandale LuxLeaks, et à 9 mois avec sursis son ancien collègue Raphaël Halet, à l’issue d’un procès symbolique pour les défenseurs des « lanceurs d’alerte ». 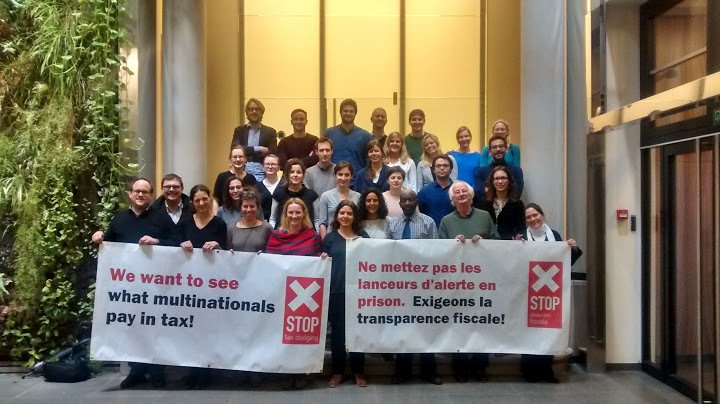 Tax Justice campaigners today condemned the punishment of Antoine Deltour and Raphaël Halet – two whistleblowers who were instrumental in exposing the infamous ‘Luxleaks’ scandal. Mr Deltour was given a 12 month suspended prison sentence and a €1500 fine. Mr Halet was given a 9 month suspended prison sentence and a €1000 fine. French journalist Edouard Perrin was acquitted. All three men helped expose the secret sweetheart deals signed by the Luxembourg government that allowed numerous multinational corporations to reduce their tax bills dramatically, in some cases to less than 1%. Tove Ryding, Tax justice Coordinator at the European Network on Debt and Development (Eurodad) said: “The sentences imposed on these men are a complete disgrace and an indictment of the system that has condemned them. They acted in the public interest and deserve thanks and protection from prosecution. They revealed the secret tax deals that allowed huge corporations to pay next to nothing to the public purse. These kind of deals mean both developed countries, and the poorest nations in the world, lose billions every year. Ce mois de juin 2016, crucial pour la protection des lanceurs d’alerte ? L’appel d’Elisa Lucet – pour défendre le journalisme d’investigation face au secret des affaires – une pétition à signer, si vous ne l’avez fait … ! OMEGA DIAMONDS : le procès des diamants sales, ce 14 mars 2019 – Requiem pour Laniado, le grand patron d’Omega Diamonds ! – Appleby, les Bermudes, les « Paradise Papers », la nouvelle fuite d’ICIJ … Appleby a couvert des terroristes – Appleby contre-attaque contre la BBC et le Guardian – et le « contrat social » ? – Laniado et Omega Diamonds impliqués ! Une nouvelle liste noire qui élimine certains pays (un rapport d’Oxfam) – La liste des paradis fiscaux de l’Union européenne ne bloque que 1% des services financiers secrets qui menacent les économies européennes – elle ne comprend aucun Etat européen et beaucoup de confettis ! ni la Suisse, ni Jersey, ni Guernsey : quelle mascarade ! Les riches paient-ils trop peu d’impôts ? – La pétition Piketty : Taxez les riches, pas les pauvres ! – Le 4 janvier 2019, on a bien bu le champagne à la santé des grosses fortunes !